The 2013 Superbowl between the Ravens and 49ers was no disappointment as these two teams played to their different strengths for a close game. 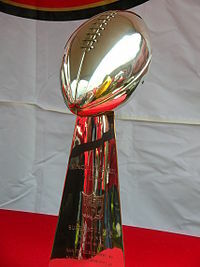 The 49ers continued their signature slow start and roaring finish to almost clinch a record 6th Superbowl win. We gathered around a pot of my slow-cooked steak chili and a pitcher of wasabi Bloody Marys with friends. Now, to facilitate discussion, time for my highs and lows. 1. Without question my favorite play was Jacoby Jones’ 108 return on a kickoff. Truly a thing of beauty. 2. Best commercials: In my view, the top prize is a tie. I liked the Doritos “Goat 4 Sale” commercial. 1. My least favorite (overhyped) commercial was the Go Daddy Kissing commercial. It seemed like the close up on the French kiss was intentionally done to drawn criticism and produce attention. 2. Blackout — I lived in New Orleans so I was not particularly surprised by the blackout, but it is astonishing that a stadium management cannot guarantee electricity for one of the most watched events in the country. Frankly, it was tough on those of us with kids who wanted to stay up for the game. We had to push them into bed before the final quarter. 3. The Harbaugh brothers. I have long disliked how 49ers Coach Jim Harbaugh yells and screams during games at the slightest provocation. It is not a particularly good role model for kids and simply boorish behavior. His brother Ravens Coach John Harbaugh showed the same lack of judgment in yelling at a stadium official over the blackout. I can understand the anger at the incompetence shown by New Orleans officials, but yelling at the guy is a lot like screaming at storm clouds because you wanted a sunny day. This is not the first blackout in a game or other unexpected occurrence. I thought Harbaugh looked like . . . well . . . his brother. I know that everyone cannot maintain our civility rule on the blog but I expect sports officials to try harder to maintain some level of composure. 4. Beyoncé. I admit that I have little respect for Beyoncé after her lip-sincing at the Presidential Inauguration. However, putting that aside, I actually thought her half-show performance was pretty lame. I understand that all of these divas make concerts a celebration of themselves, but this seemed even more ego-centric than usual. I also simply did not think the music was that great. It was a view shared by everyone at our party — young and old. 5. Ray Lewis. As discussed in a separate blog today, I found Lewis’s pre-game claim of divine acquittal of his prior double murder charge to be distasteful and a bit unhinged. I really liked Taco Bell’s Geezers Gone Wild…funny as hell. There are only agrobusinesses, no farmers. The farmer was driven off the market long ago. Now, the farmer is like the Marlboro cowboy, just a pawn to help us use our dreams to make our choices in Dodge’s favor. Whatever happened to the Ram? Surely symbolic on so many levels/facets. I wonder if the author of the Propaganda series appreciates the help to us provided by commercials in detecting the stuff constantly fed us?. PS Not important: The Marlboro commercials were shot first in 1960 not far from my Army base. The divorcee who had a little spread across the way from the meadow where the shots were made, had autographed stuff and her own photos to prove it. So those and a few other things made me believe her. PS When does Joe the Plumber become our next icon? Bonnie will live until 105 and enjoy every man-minute of it. Commercials scoring and as entertainment seems a prime American sport. With our americanized (ie commercials) channels here in Sweden, the only chance of an amusing one is if it is a direct import (without subtitles). David Blauw puts, as usual, another twist on things. All I got to round off with is a riposte to those who wish to establish position and individuality (yet be part of the herd). The example given was wasabi bloody maries, etc. Nothing personal Professor, but when do all of you Americans join the Japanese in eating poisonous fish, spiced with Kimchi, dried Yak jerky, and roasted wolf t***s? Is there nothing you will not put on your bodies, in your mouths, out of your mouths, etc to keep up with and exceed the others.? PS Guess I thought the guys in drag for Doritos were cute. As a dig at macho men. Which obviously I am not. Boo hoo. Obscene (ie raunchy) ending about 10-inchers censored. There might be children reading here, not just childlike minds. I enjoyed the game and make it a habit not to watch the commercials or half-time. I had a variety of chores I got up to do during most commercials. I watched TCM during half-time and saw the first half-hour of “The Music Man”. Robert Preston can beat out Beyounce any time, any day. During the blackout, my sister and I played Scrabble with the TV muted. What about Luck? He can run and pass. The 4th best runner of the group, but no slouch. And he a Kap are 1 or 2, take your pick re: arm. How about some love for the honky. Luck is good, but he’s not as good as Colin, Wilson and/or RG3. Luck’s QB rating was below theirs. Maybe as the years pass this will change, but for right now that’s what I think based on watching them all play. I must mention though that I found it a thoroughly entertaining game, even though I was mildly rooting for SF. Flacco proved himself to be a premier quarterback, but I felt was held back in the second half when the Rave’s Harbaugh became too conservative. Kaepernick, is at this point one of the most exciting Quarterbacks that I’ve ever seen. His arm strength ranks with the best and I’ve seen the likes of Unitas, Namath and Darryl LaMonica. Given his limited experience he played a great game and his running is the best of any QB I can remember including Archie Manning, Fran Tarkenton, Doug Flutie, Moon and Vick. To me he is the best of the three young great QB’s today when you add Wilson and RG3. Hated it and found it bordering on disgusting. Boo Professor, my parents would have let me stay up and take off school the next day. Of course that could be why I always led my classes in absences, had a terrible disciplinary record and was a consistent C- student. Thank God for standardized testing, or I might have needed to be a gigolo. You realize of course that the Harbaugh’s, sons of a “tough as nails” coach, exemplify the mach male mythology of the NFL. They have reached the acme of NFL “Iconology”, which I’m not sure is a good thing. Then again my favorite all-time coach was Bill Parcells. Perhaps the most boring half-time show I’ve ever seen. Her talent consists of a great body, the ability to “bump and grind” and a so-so singing voice. I say this not because I’m an Old Fart nurtured on Rock ‘ Roll, I like many of the modern artists and their forms of music including “hip-hop”. Beyonce has little talent and the proclivity to stage dance productions reminiscent of the “June Taylor Dancers” on Jackie Gleason’s variety show, if anyone’s memory goes back that far. The tribute to farmers was awesome. If this commercial ran 50 years ago it would have been very accurate. Though nature and evolution have been responsible for the strength and endurance of these very capable and sacrificing human beings. To bring this ad up to date, simply remove the word God from Paul Harveys lips and substitute Monsanto. The Super Bowl is the ONLY show I don’t mute commercials. I may start next year. Beyonce picked the wrong event to lip synch. Her performance was very mediocre with poor sound and all those lights apparently blew a fuse. Her show was a lot like Madonna’s -skimpy black outfits and a lot of hip thrusting. Not even appropriate for children. ENOUGH. The Budweiser commercial was THE BEST! Showing the human animal bond between that man and the Cydesdale will hopefully be one chip in breaking down the wall we have built up between ourselves and the rest of the animal world and the environment. Our alienation and speciesism is not serving us well. One of the better Super Bowl games. The blackout was quite a twist. From on the ground and at the game, all I can say was it was a great time, exciting game, awesome parties, fun people. The best Super Bowl I’ve ever attended. Blind Faithiness I agree it was expected to happen and, with the assistance of the blackout, the game ran late enough to where most kids would be asleep. Personally I was more offended by Beyonce’s halftime performance but thought Flacco’s celebration was worth mentioning. Gasp! Someone said the F-word after the game?!? What will the Puritans think about our violent, commercialized circus now! BWinsler, its not that big a deal unless you make it a big deal. Not to mention CBS needing to do a better job of censoring the post-game handshakes. Part of blame falls on players for needing to know the cameras are following them but CBS needed to be better prepared – especially around Flacco. The early M&Ms commercial got my vote but I’m partial to the candy and an avid Meatloaf fan. San Francisco seemed to be asleep during the first half, to me anyway…. Or maybe the Raven’s defense was as good as it looked. You can’t win the ‘BIG GAME’ by only playing the second half…. That’s been proven many times before….. The Taco Bell commercial was a riot, as was the original teaser for it. Consider the source concerning Ray Lewis’ comments. The game was pretty good, but I don’t know what caused te blackout so I cannot respond as to who was at fault. I enjoyed the Taco Bell commercial.